It's fast, not fancy. There are no dynamically calculated shadows cast by beautifully rendered translucent 3D dice here. The user interface is geared towards rapid rolling. So, if you just surprised the brave party of adventurers with an army of thirty bandits who all need to attack, then this is the app for you. If the party wizard unleashes a spell that does 10d6 damage on your hapless ambush, then this is the app for him too. 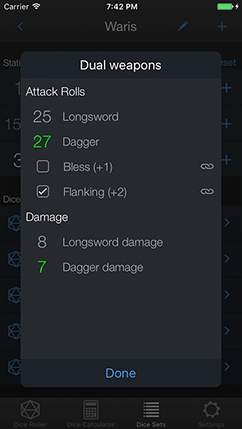 Use the Dice Roller for quick rolls of standard dice or the Dice Calculator for complex, custom rolls. 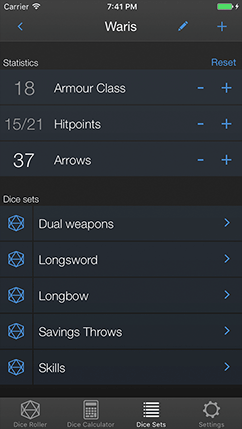 The Dice Sets allow you to create and store all the combat details you need for your character - every roll, every modifier and any important statistics, all sorted into folders. The best part? You can roll all the dice in a folder with one tap. All your attacks, all your damage, all your modifiers, all at once. Dice Ex Machina: Keep the game moving.